The purpose of the jobs module of Microsoft Dynamics NAV is to support project-savvy companies (like engineering or construction companies) to better control their projects from within the ERP system. However, this module seems to focus more on the needs of a financial project controlling rather than on the requirements of a day-to-day project management. In this blog post you can learn how to complement the financial project controlling capabilities of your NAV 2013 and 2013 R2 system with interactive Gantt charts to facilitate a graphical drag & drop project planning. Proper project controlling requires taking into account a variety of data: ressource allocation, resource costs and consumption (actual vs. plan), item consumption, project booking principles (percentage of completion method with its multiple variants) etc. The NAV jobs module reflects this complexity as it combines different data from different NAV modules. The initial outcome is a list of projects (the jobs list) providing a high-level overview of the projects and some key financial indicators. This list is the "entry point" into the NAV jobs module and it already indicates the financial focus of this module as it does not provide any planning and scheduling related information such as timeframes, milestones and timeliness of projects. Even if you drill down into one project using jobs tasks and job planning lines, you will continue noticing how "book-keeping"-centric project planning in NAV is. The job tasks show the general structure of the project's sub tasks, and also provide time-related information such as task start and finish date. However, what is completely missing is the capability to work with dependencies between job tasks such as start/start, start/finish, finish/start and finish/finish relations. Even more: if you change the finish date of one job task, the start date(s) of the subsequent job tasks are not automatically updated, but need to get changed manually. The job tasks hence allow to understand the "work breakdown structure" of the projects and to manage WIP and the related invoicing tasks, but it does not support time management in an ideal way. The function of the job planning lines basically lies in the allocation of resources to a job task. This is an important aspect of project management as it impacts the "delivery side" of a project. However, there are again some elementary functions which are missing in the standard Dynamics NAV. In essence they are related with the resource allocation and scheduling: NAV users cannot see at all resource conflicts. That means if a project engineer had already been assigned to work on project 1 at e.g. May 22, NAV does not give any warning if the same engineer is assigned to project 2 at the same day. Also, when allocating people to tasks, NAV users cannot immediately see to which degree these people are already planned to work on different project tasks. Well, the (sad) truth is that the standard Dynamics NAV jobs module does not offer these intuitive project planning capabilities. 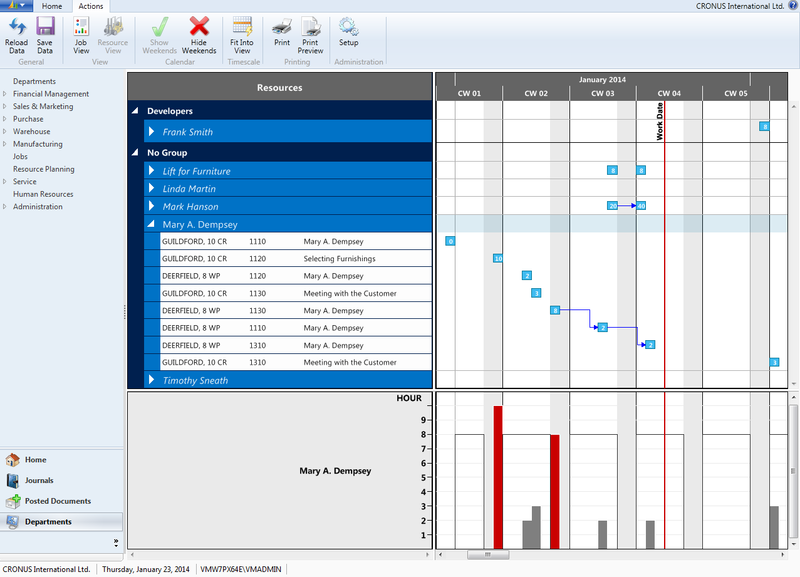 The Visual Jobs Scheduler (VJS) enables project planners to see, understand, manage, control and change jobs, job tasks and job planning lines with an interactive planning table – a Gantt chart. 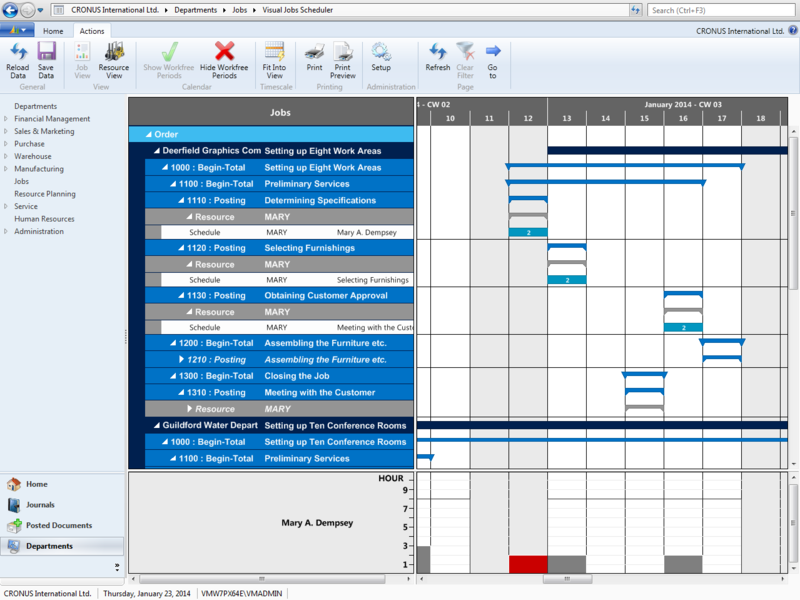 With the Gantt charts, the complexity of projects becomes transparent and therefore more manageable. The planner can switch between a project-centric and a resource-oriented view. These two views reflect the different planning challenges of timeliness and proper resource allocation and utilization. So the combination of both views provides the planner with comprehensive decision support information for changing or keeping job tasks and job planning lines. The Jobs View visualizes all jobs in one overview. Hierarchically structured from the job down to job tasks as well as showing the according resources, the jobs become transparent for the project manager. In addition, the capacity of the resource is visualized in a histogram and provides information about potential or actual bottlenecks. If you compare the above chart with the list view of the job task lines, provided by Microsoft Dynamics NAV, the benefit for the planner becomes obvious. The Resource View visualizes resource groups and resources. Similar to the Jobs View the histogram provides information about the utilization of resources. That way, planners can oversee all resources at one glance. This enables them to find suitable alternatives in case of bottlenecks quickly. Besides the visualization of jobs, job tasks and resources, there is one thing that makes the Visual Jobs Scheduler really attractive for planners: with the interactive functionality of the Gantt chart, they can easily, smoothly and much faster reschedule tasks, jobs and resources . The VJS is fully integrated into Dynamics NAV so that the changed data in the Gantt schedule can be updated in the NAV database with one mouseclick. You may have noticed from the screenshot above; The Visual Jobs Scheduler also allows you to interactively draw links between dependent job planning lines, between dependent job tasks and between dependent job tasks and planning lines. For example: one job task is a kickoff preparation and another job task is the kickoff. It should go without a saying, that the kickoff only can start once the preparation is done. The reality is: the standard NAV also allows you to ignore these dependencies. If you have these kind of dependencies in your projects, just create them by painting them with the Visual Jobs Scheduler. Of course, they get saved in a specific table and are available when you start the VJS next time. Browse through our recorded webinars to get a more detailed idea about the functions of our Visual Scheduling Suite.